Context: The role of students and tutors as valued partners in engineering education has become an integral part of the mechanical engineering Design Graphics and Communication (DG&C) course within the University of Adelaide. As the DG&C course transitioned towards more democratic student-led directions, the teaching team developed a framework to facilitate students' learning; the Optimising Problem Solving (OPS) pentagon. The OPS pentagon was introduced in the 'Thinking Like an Engineer' workshop at the 2014 AAEE conference, where the efficacy of OPS was put to test by a group of 42 educators, including 40 engineering education academics. The workshop was highly successful, providing valuable positive feedback as well as a verifying that the OPS pentagon is an effective framework to facilitate democratic student-led learning. Purpose: An invitation, resulting from the AAEE workshop, for the University of Adelaide tutors to facilitate a problem solving workshop for first year engineering students at the Australian Maritime College provided the opportunity to engage new students in the creation and ownership of their own learning. The purpose of this paper is to present preliminary perceptions from students and tutors on their coparticipatory learning in critical thinking and problem solving, gained from this workshop. Approach: The approach used in this study is grounded in Action research in which an iterative, systematic, participatory, and empirically based process is applied to improving practice. As part of this process, students have a dual role as learners and as educators while educators have an additional role as learners. Results: Results from this study indicate that students were clearly able to identify areas of learning and skills development resulting from participating in the workshop. Transferability of learning was also demonstrated through students’ self-identified application of extended problem solving capacity to their project work. 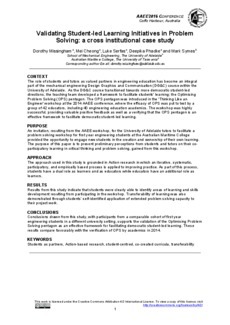 Conclusions: Conclusions drawn from this study, with participants from a comparable cohort of first year engineering students in a different university setting, supports the validation of the Optimising Problem Solving pentagon as an effective framework for facilitating democratic student-led learning. These results compare favourably with the verification of OPS by academics in 2014.